For over 100 years, Lithia Park has been the center point of Ashland’s natural beauty and enchantment. Established in 1908 at the request of the women of Ashland, it was the first park in Southern Oregon. It was later expanded and named Lithia Park because of the lithium springs that can still be found on the grounds. Designed in part by John McLaren, long-time superintendent of San Francisco’s Golden Gate Park, it covers 93 acres right off the Plaza, at the corner of downtown. Enjoyed by folks of all ages, Lithia Park offers well maintained trails that follow Ashland Creek and lead to Japanese gardens, tennis courts, a children’s playground, duck ponds, groves of sycamore trees and beautifully manicured lawns. Whether it is a scenic stroll, the perfect picnic, your special wedding day or a reunion, the park welcomes all. It is the gateway to adventure and the Ashland watershed. Many mountain bikers, hikers and trail runners begin and end their excursions using the park’s accessibility. For example, the Mt. Ashland Hill Climb Bike Race that occurs each September begins in Lithia Park and ends atop Mt. Ashland, rising 7600 feet in elevation over 18 miles. Each season brings different colors and Lithia Park, providing an ideal backdrop for photographers and artists. The Ashland community also enjoys the Butler Band shell in the park, where there are various events and activities presented throughout the year, including Ashland High graduation, City Band concerts, the Fourth of July Celebration and Ballet in the Park with the State Ballet of Oregon. 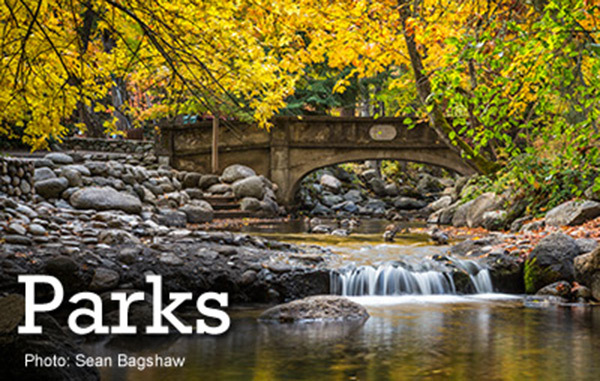 Voted one of the best places to kiss in Ashland, Lithia Park is the perfect, romantic venue for many wedding engagements, marriage ceremonies and celebrations. Ashland is home to 24 other parks and facilities, each lending its own charm and vitality to the community. For example, Garfield Park offers a water play area, playground and great space for an outdoor birthday party. In addition Garfield Park provides two sand volleyball courts for great competitions! Hunter Park provides a community swimming pool, tennis courts and softball/baseball fields. For dog owners, there is a special dog park set aside for dogs to play. It is Ashland’s law to have dogs on a leash at all times in public space. For skateboarders of all ages, Ashland’s own skate park located on Water Street is well kept and valued amongst the community. North Mountain Park houses a Nature Center, demonstration gardens, playing fields, access to Bear Creek and several acres of wildlife-friendly open space and trails. The Nature Center offers workshops, classes and after school programs. It is also the location for the Bear Creek Salmon Festival and Rogue Valley Bird Day. (www.northmountainpark.org). In addition to the parks themselves, the Parks and Recreation Department offers many activities for youth such as swimming, golf, tennis, rafting, kayaking and track and field events. Enjoy Ashland’s public golf course, Oak Knoll. Open year round. Classes offered. It is a regulation 9-hole course, with a driving range and snack and pro shop. For more information refer to the Golf section of this Guide. For additional program and park information call the Ashland Parks & Recreation Administration office at 541-488-5340.